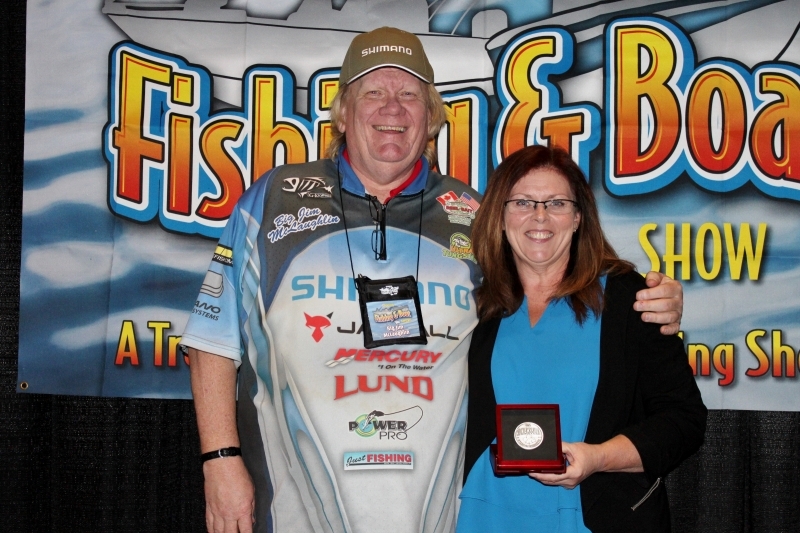 Yvonne Brown, received the prestigious Rick Amsbury Award, and became the first female to be placed in the Canadian Fishing Hall of Fame at the recent Spring Fishing and Boat show in Toronto. This award is presented to an individual that has made a significant influence to the fishing community and Yvonne has proven that with her dedication to her Fishing 101 for women organization. Yvonne is a strong advocate of getting women and children outdoors and on the water. Yvonne started fishing as a child with her Dad but it wasn't until later that she was able to get out on a bass boat with a friend and learnt how to set up her rod/reel rigged up for walleye. She also spent time learning how to use her first spinnerbait and senko for bass and she was hooked on bass fishing. 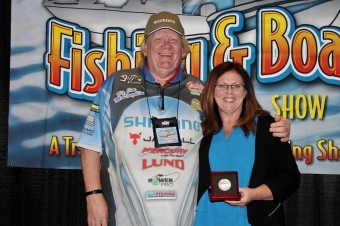 That winter she decided to join the Port Perry Bassmaster's and during the Spring Fishing Show, she decided to get serious about tournament angling. During that season, Yvonne participated in club tournaments and was involved with the Kid's Fishing derby. She was also asked to become an instructor for OFA and WOW (Women's Outdoor Weekend) which included 10 activities that women can try, including fishing. Having enjoyed working with women, Yvonne formed and created Fishing 101 for women, and through seminars, and instructional classes, women learn the basics of angling from which type of rod to purchase, knot tying, fish identification to regulations and safety on the water and rod protection. Yvonne is also a competitive angler and learnt from the best in her first year with the CSFL Kingston Open. She was fortunate to be an amateur and fished alongside Chris Johnston, JP DeRose and John Whyte. Having these partners enabled her to make it to the stage for weigh-in and she gained confidence to enter the Ontario Bass Nation Qualifier. H er summer is busy with competitive tournaments, events for Ontario Women's Anglers - an advanced group of female anglers, and instructional courses for Fishing 101 for Women. As an ambassador for the Canadian Sportfishing Industry Association, she promotes National Fishing Week and the Keep Canada Fishing initiative at every opportunity. Yvonne writes for several outdoors publications, participates in a number of fishing tournaments during the season and volunteers her time at kids’ derbies and charity events throughout the year. The Rod Glove has been a sponsor of her organization and she instructs women on protecting their fishing rods and reels. In some of her events she even displays a rod that has been unprotected with chips on the rod and broken guides and then one protected by The Rod Gloves, which is in new condition. Yvonne's advice to new female anglers is to "fish for fun and to learn along the way". She says to "look at clubs and tournaments as a learning experience and that integrity is paramount."